Yamato after being hit by multiple U.S carrier aircraft attacks during operation "Ten-Go", 7 April 1945. The destroyer (centre) is either Fuyuzuki or Suzutsuki. 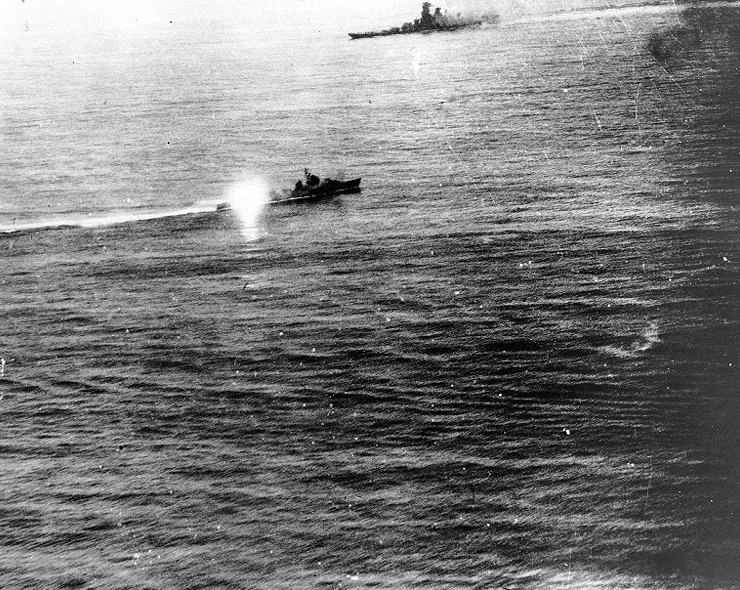 The bright flash is probably the result of the 100mm guns firing at the moment the photo was taken. Source: Official U.S. navy photograph, now in the collections of the National Archives (# 80-G-313714). If you have spotted any errors on this page (Battleship Yamato after being hit by multiple U.S carrier aircraft attacks) or have anything to contribute please post it on the battleship forum.